“Take us to the Equator, please,” Dan asked our taxi driver as we threw our bags in the trunk. “Which one?” our driver asked. “There’s more than one?” I gasped, incredulous. After muddling through in our limited Spanish we finally worked it out. We would go to three monuments, each one claiming it stands on the real Equator. Good thing they were all close to each other, 30 minutes outside of Quito. He promised our trip would only take a few hours. We’d still have plenty of time to catch our afternoon flight home. Our taxi driver wound through the capital’s neighborhoods, pointing out landmarks along the way. We passed through industrial districts and residential areas. Some of them might have been questionable, but others were quite impressive. We marveled when he pointed out the president's ordinary-looking home. Where were all the guards and the vast lawn for protection? Turning a corner, the city abruptly ended and we found ourselves on a wide highway that would rival any in America. The road twisted and turned down the mountain and we swayed with the car as it took the curves. Suddenly he braked and gestured out the window. There, in the middle of the square, stood a short, grafitti-covered obelisk, topped with a stone globe. I have to confess it was rather disappointing. Save for two dogs, we were the only ones there. This was no tourist mecca; I couldn't even see a single souvenir shop nearby. And a local was staring at us. We climbed out to take some cheesy tourist photos anyway. At least the dogs were friendly. 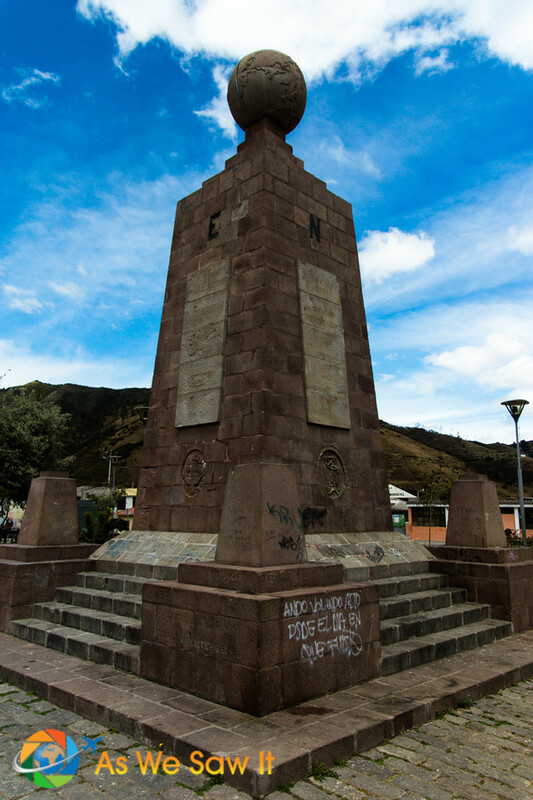 This 10-meter-tall monument was the first one, built back in 1936 to mark the equator line. The government moved it here when it decided to build that huge tourist attraction down the road. Stands to reason; no one else was around. Who knows about it? This might have marked the middle of the world a century ago, but according to modern calculations and Wikipedia we were standing on a line 164.9 meters south of the true Equator line. So we paid the $4 admission fee and went in. Our tickets to Intinan Museum included a tour with an English-speaking guide. She pointed over the wall. 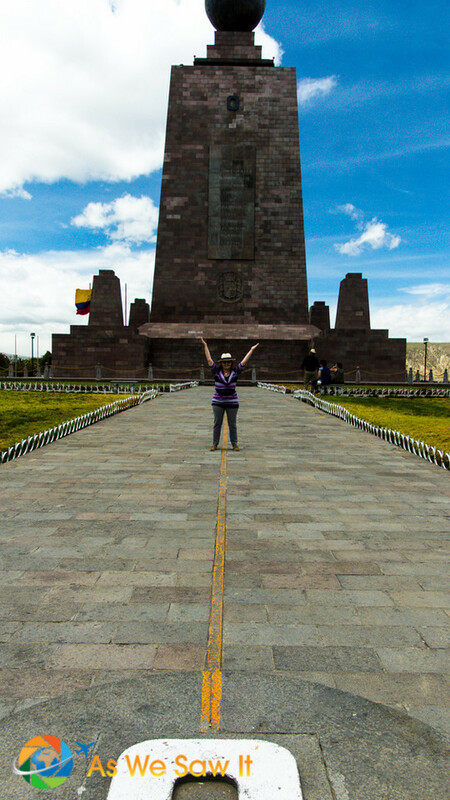 “That huge monument next door that all the tourists visit marks a false Equator line. 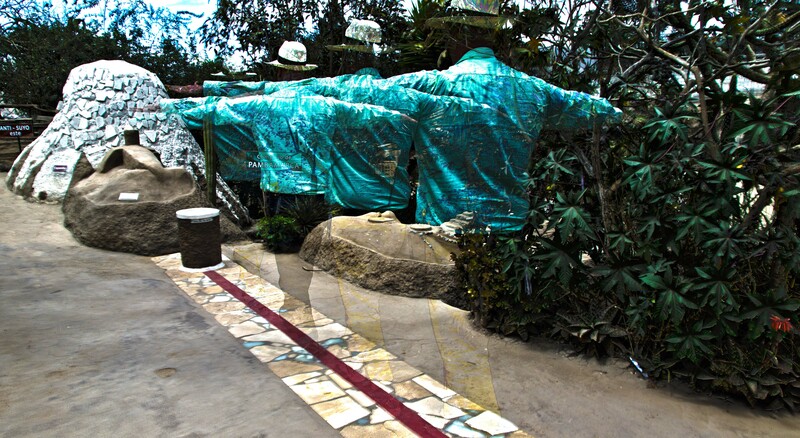 The line behind our museum,” she boasted, “marks the true Equator.” She explained it was determined by GPS after that big super-park tourist attraction had been built next door. Anyway, we finally ended up at a small outdoor area with a bright red line painted down the sidewalk. We posed on the line (say cheese! ), did a few stunts, and checked out the museum. Back to our taxi. A quick drive around the corner, and he pointed to our final stop. Have you seen all those cheesy photos of people posing on a bright, red line with a megalith in the background? This is the place: Mitad del Mundo, Middle of the Earth. This is a mini-theme park complete with gardens, restaurants, and a huge, 30-meter-tall monument. You can even buy a combo ticket so you can climb to the top of the monument and visit the ethnological museum inside. OK, yeah, it’s a tourist trap … but it’s one of those things that you sort of have to do. After all, in a country named after the Equator, isn’t it sort of expected that you’ll bring home photos of yourself taken with one foot in each hemisphere? 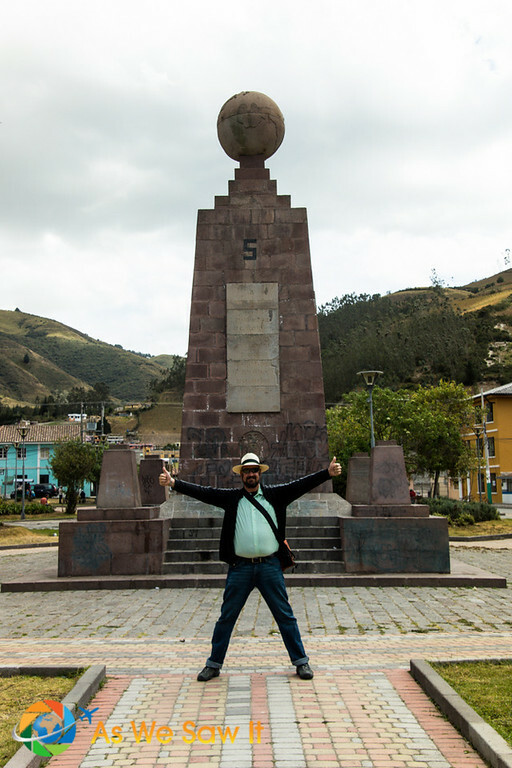 What they don't tell you: The latitude of La Mitad del Mundo monument is 0°00'08”, placing it about 250 meters south of the equator. But after spending all that money on this place, nobody's going to tell the tourists that they are posing on a fake Equator line. We did it anyway. And so did a pile of other people. Just so you know: The East side of the monument is better for photos. However, when there's an entire busload of eager Chinese tourists mobbing the area, you might as well cut your losses and head straight to the West side. We had asked our driver to return in an hour and a half, so after our photos we relaxed at one of the park’s restaurants and had a bite to eat. Our meal was surprisingly cheap for a tourist attraction: two burgers with fries and a large beer to share came to the grand total of $5. I'm thinking American amusement parks just like to overcharge people because they can. 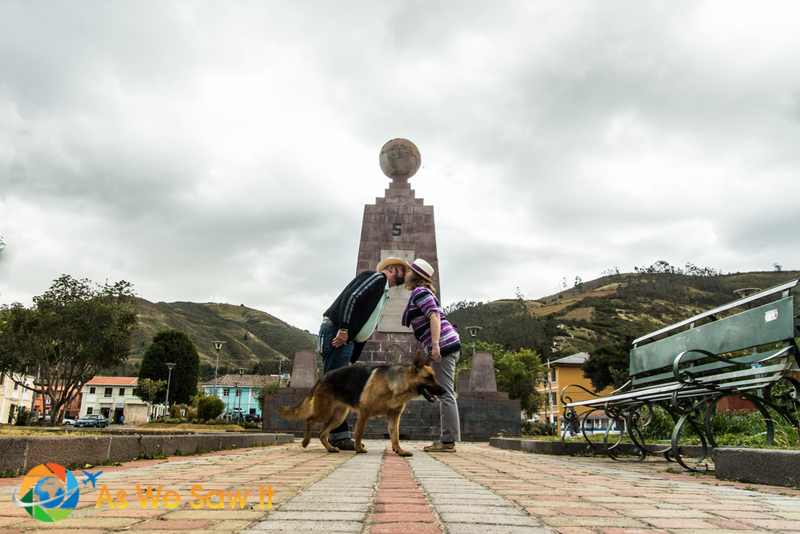 As we flew back to Cuenca that afternoon we agreed that searching for the real Equator was a fun way to pass our last morning in Quito. Cheesy or not, those photos are a great memento of our trip and there’s no mistaking where they were taken. Even if we never made it to the actual zero-latitude line. Not long after, I got curious and did a bit of research. There are actually two points of interest positioned exactly on the Equator: the Catequilla archaeological site and the Quitsato Sundial. 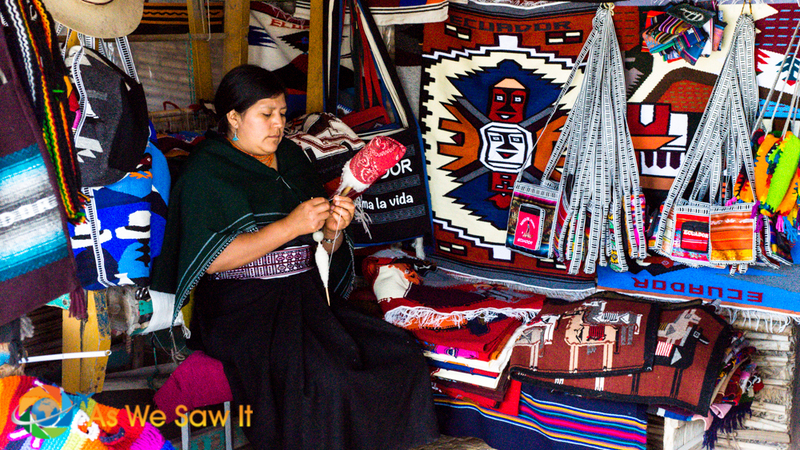 Maybe we'll grab some photos the next time we go to Quito. In the meantime, it seems Equador's government is quietly admitting their goof-up. They have plans to build the world's tallest building, on the actual Equator. I hope they double-check their GPS coordinates before they break ground. Lodging: If you're staying in Quito, check hotel prices at HotelsCombined or Booking. Private tours: Want a unique experience? We have had good experiences with Get Your Guide, a reputable source for booking a wide variety of local tours, attractions and activities. That's why we've chosen to affiliate ourselves with them. 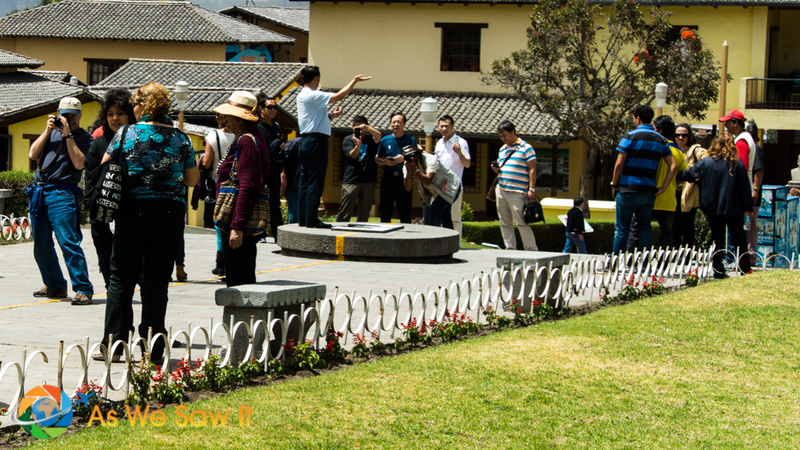 This equator tour includes more than one site. For more sightseeing, see more Middle Earth photos on our Mitad del Mundo photo gallery. Find a list of our related articles on our Ecuador article page. This is an article anyone visiting Ecuador should watch, thanks for the tips! Ecuador is indeed a fun place to visit. You can spend time in cities like Quito which marries an ancient architecture with modern touches, or venture into the sprawling nature which includes the Amazonia rainforest, the Galapagos Islands and even the highest active volcano globally! Do be wary of spilling scam, Galapagos cruise scam, bus theft and robbery, long taxi routes, ATM scams, take my baby and many more! It’s a worldwide problem and it’s not just targeting tourists. There’s always someone who’s looking to cheat someone else. I love your web site. I have lived in Ecuador for over five years now. I just tell everyone visiting, that unless they have a GPS on them, to forget visiting the Equator. People need to remember that in a land of daily earthquakes and active volcanoes, the land moves. They have talked of updating the Ecuador memorial, but unless it is put on wheels, it will be out of date before it is up. Putting the memorial on wheels? You’re funny. But seriously, we thought it was fun, doing a “grand tour” of all the memorials. It gave us a laugh all the way home. It all seems like quite clever marketing! And if you had a good time in all three spots, then it’s a win-win. I enjoyed learning about the equator tourist spots. You’re right, it was a win-win. We had fun and got some great photos we can look back on in later years. I agree with Jen – I love all of your kissing photos, how fun! And you made your flight, right? Made the flight? Sure did. We got to the airport so early they weren’t even checking passengers in yet. Good thing they have a Johnny Rockets at Quito airport. Had a malt. Yum. This is a great post! 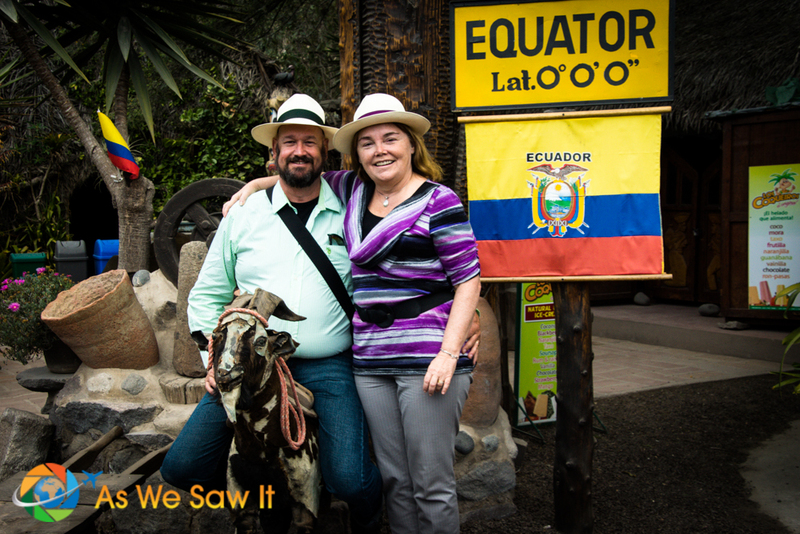 Love the photos of you guys posing in the “Equator”. Thanks. There’s a lot to be said for cheesy photos. 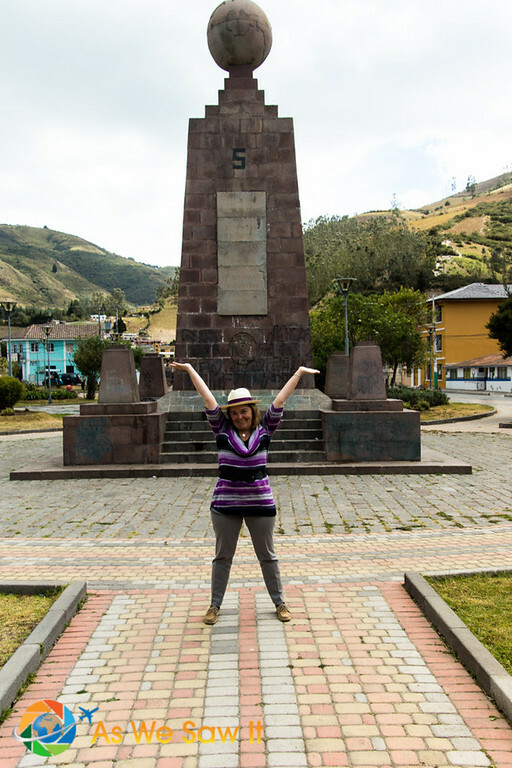 Kim and I will have to visit this “touristy” group of monuments next time she and I are in Ecuador together. Love the “cheesy” photos. They are the most fun. Especially the one with Linda holding the ball on top of the monument! Great photo (in my humble opinion!). Ha! Thanks for sharing this post! Super job! Thanks, Mike. Mitad del Mundo is fun and the museum is worth the $4 admission even though the experiments they show aren’t actually scientific. I think you’ll enjoy yourselves. Let me know what you think.